The standalone digital-to-analog converter -- a product genre that has dwindled to relative niche status over the last decade -- has recently come roaring back to life for one reason: the emergence of computer-based audio. DACs are now hot. For many years, particularly through the 1980s and early 90s, the separate DAC was a staple of high-end-audio systems. Companies like Mark Levinson and Krell produced statement-level DACs that held pride of place in the very best rigs of the day. But over time, beginning in the late 90s, it was models comprising a disc transport and DAC in a single box that overtook the CD-player market. There were many reasons for this, not least of which were convenience and cost: one box is cheaper to make, buy, and find room for on a rack than two boxes of the same size. Then there was sound quality. Designers and audiophiles learned of something called jitter -- timing-related errors generated in the transmission of a digital datastream -- and that the greater the jitter, the worse the sound. It was generally agreed -- by the engineers who designed them and the users who listened to them -- that, all else being equal, one-box players had the potential of producing less jitter and thus better sound. One-box players became the choice of most CD-playing audiophiles -- and, had the Compact Disc retained its dominance over digital audio, the hegemony of the one-box player, too, might have remained unchanged. Enter the computer. Exit the transport. Now that the computer, commonly termed a music server, is the primary signal source for many audiophiles, the DAC has reemerged as perhaps the hottest product category in todays audiophile market, and the prices of standalone DACs are now often more reasonable than one might expect. For instance, Ayre Acoustics QB-9 DAC, which many regard as representing the state of the art of the USB DAC, costs a relatively affordable $2500. The Weiss Minerva FireWire DAC, another contender for state-of-the-art status intended primarily for computer applications, is $4500. Considering the level of performance these products offer, these arent horrendous prices. By comparison, Mark Levinsons No.30.6 and Krells Reference 64 both cost over $10,000. But if $2500 to $4500 is what you can now expect to pay to get top-shelf digital performance from your computer, what should you expect to pay for merely very good performance? Many DACs are now available for anywhere from $99 to $999, and many of these have found favor among audiophiles who have realized that a computer can be a cost-effective front-end source component for a great two-channel audio system. The subject of this review, the Devilsound DAC ($399 USD), is such a component. It doesnt look like a DAC . . . The Devilsound looks a bit different from the usual DAC, but in this instance the casework and physical layout arent just novelties but cost-saving features that make that $399 price even better than it at first seems. The DAC itself is housed in a small aluminum case that, in terms of placement, is a complete nonissue. In fact, its easier to think of the Devilsound DAC as a set of cables that just happens to include a built-in DAC. Simply run this cable with the bulge in the middle from computer to preamp, and let the Devilsound DAC hang out wherever it ends up hanging out. Your computer will immediately recognize the Devilsound as an audio device, so theres no need for additional drivers; this is very much a plug-and-play device. The Devilsound DAC includes two sets of integral cables: a USB cable to receive your computers digital signal transmission on one end, and a pair of RCA cables to feed an analog signal to your preamp at the other end. 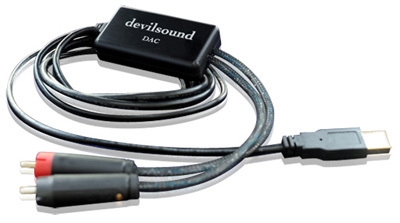 If a decent USB cable costs you around $20 and a good pair of interconnects about $100, then the actual cost of the Devilsound DAC itself is closer to $275 -- about as "budget" as it gets for a legitimate, audiophile-approved front-end component. 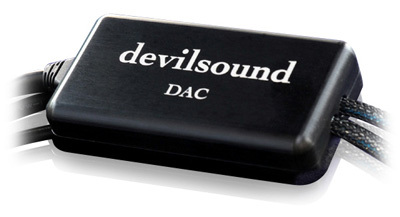 The Devilsound DAC is a 16-bit device that can accommodate sample rates of 32, 44.1, and 48kHz. It doesnt oversample, and uses as its USB input receiver a Burr-Brown PCM2706 chip -- which, according to the Devilsound website, can recover the digital signal from a USB connection with very little jitter. The digital signal is then sent to an Analog Devices 1851RZ-J chip for conversion to analog. Although the Devilsound DAC derives its power from the computers USB port, a DC-to-DC converter regenerates incoming power to reportedly filter out any switching noise and provide the DAC with stable, regulated power. 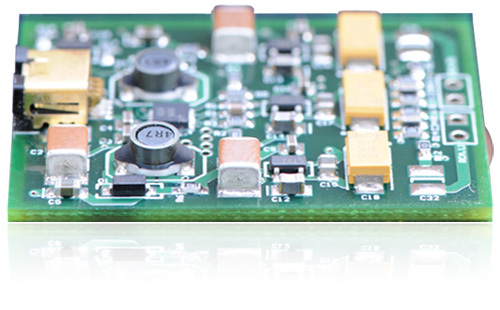 The DC-coupled output stage uses whats claimed to be a high-quality op-amp, obviating the need for coupling capacitors. Those wanting to delve deeper into the Devilsounds technical elements can read the complete design brief on the companys website. All Ill say here is that its clear to me that, though this tiny component has very little wow factor at first glance, it appears to have been designed with sound quality as the No.1 goal. I connected the Devilsound DAC to the USB output of my Apple MacBook laptop, and its RCA plugs to either a Simaudio Moon Evolution P-8 or Boulder Amplifiers 1010 preamplifier. The power amplifiers were either Class� Omega Omicron Monos or a Boulder 2060 stereo amplifier. Cabling and power conditioning was the latest from Shunyata Research: Aurora-IC interconnects, Aurora-SP speaker cables, Hydra V-Ray II power conditioner; and Anaconda Helix Alpha/VX, Python Helix Alpha/VX, and Taipan Helix Alpha/VX power cords. Speakers were the Rockport Technologies Arrakis. The big news is that I found the Devilsound DAC to be, for all intents and purposes, tonally neutral -- I heard no tonal variations that would lead me to conclude that it was coloring the sound in any way. Voices, male and female, sounded as voices should: clear, textured, and nuanced -- at least when theyd been recorded that way in the first place. For example, the singer Eden Atwood, on tracks from her 2004 album This Is Always: Ballad Session (CD, Groove Note 1022), sounded properly scaled -- the size a real person should be within a nicely dimensioned soundstage -- and detailed enough that I could clearly hear her subtle inflections. The accompanying piano on "Day by Day" was tonally neutral throughout its frequency range, full-sized within the soundstage, and sorted out such that it didnt mush together with Atwoods voice. The overall sound of this track was smooth and rich, but didnt sound at all hyperrealistic. On the contrary, it sounded inviting and relaxed -- which fits Atwoods voice and singing style just right. I heard this same smooth, relaxed quality in "Tall Trees in Georgia," from Eva Cassidys Live at Blues Alley (CD, Blix Street 10046). The Devilsound DAC was able to reproduce Cassidys speaking voice at the beginning of the song with finely textured detail, while keeping ambient noises such as tinkling glasses intact and wholly separate. The air around Cassidys physical presence at the beginning of the track was palpable, creating a wonderful sense of space and aliveness. Cassidys image was kept precisely dead center and, again, tonally honest. Perhaps most surprising for an inexpensive DAC, the Devilsound was very good with the higher frequencies. It was able to reproduce cymbal crashes without obscuring the detail with hash or noise, and it was never offensive, even with recordings of only mediocre pedigree. I dont mean to imply that the highs were perfect: The Devilsound did soften the upper frequencies just a touch, which could be a benefit in some systems and with some recordings of lower quality. However, it wasnt overtly soft; this softness was only in direct comparison with the much more expensive Bel Canto DAC3VB ($2695) with VBS1 ($1495) power supply. In fact, I think its fair to say that the Devilsound DAC fell down only in an A/B test with that far pricier piece of gear. Even then, its shortcomings were never offensive -- it didnt do that much wrong, it just came up short in a few areas. For instance, the Devilsounds bass didnt have quite the Bel Cantos heft and depth. On "Low," from Jonas Hellborgs 1991 album The Silent Life (CD, Day Eight Music 26), the Bel Canto rig lent more weight to the bass guitar, making it more prominent, and more easily heard and felt. This gave it a greater sense of realism. Still, through the Devilsound DAC I was able to follow the bass line in this track with satisfying precision -- which is important, as bass articulation is the heart of this instrumental album on which the only instrument is the bass guitar. On the next track, "Black Market," the sound was plucky and agile over the Devilsound, giving the listener a well-defined sense of how good Hellborg really is. In fact, if you have a system that can play low and articulate, this album is a must-have. Youll enjoy it through many playings, and its an excellent test of your woofers ability to track accurately way down low. The other area in which the Devilsound didnt quite match the Bel Canto was propulsive drive. The more expensive DAC gave life and sparkle to music that was, in comparisons, hard to ignore. This was easy to hear when I played tracks with clearly recorded acoustic instruments, for instance, where the leading edges of transients sounded more distinct and visceral through the Bel Canto. But what the Devilsound did do well, even in direct comparison to the Bel Canto, was to maintain a great sense of balance and detail, particularly with vocal-rich live recordings. "North Dakota," from Lyle Lovetts Live in Texas (CD, MCA MCAD-11964), sounded exceptionally clear, with rich tone color, while producing a convincing approximation of the recording venue: airy and present. Low-level ambient sounds were clearly audible within a wide, fairly deep soundstage. Rickie Lee Jones joins Lovett on this track; the Devilsound kept the singers nicely separated in space while delivering a softly focused soundstage that kept me focused on the music, and not on the laser-like placement of every single molecule. The Devilsound DAC is perfectly capable of delivering high-quality sound from a computer to most audio systems. Its tonally accurate, has a satisfying degree of resolution, and reproduces musical subtleties with surprising nuance and focus, particularly in the midrange. What it cant do -- the deepest, weightiest bass; the most lifelike leading edges -- shouldnt really be surprises in a component costing only $399. But there seems little point in listing what this DAC cant do when compared with a far more expensive model -- anyone considering buying a Devilsound wouldnt be interested in such products anyway. What impresses me is that such an inexpensive device can get so many things so right. And when you factor in the cost of the included cables, well, its easy to envision the Devilsound in a system based on a computer you already have, a pair of EgglestonWorks Dianne speakers, and a Simaudio or Bel Canto integrated amplifier -- for about $6000, youd have quite satisfying sound.